After hundreds of survey miles with no right whale sightings, Catalog #3513 and her calf appeared in the Bay of Fundy last week. 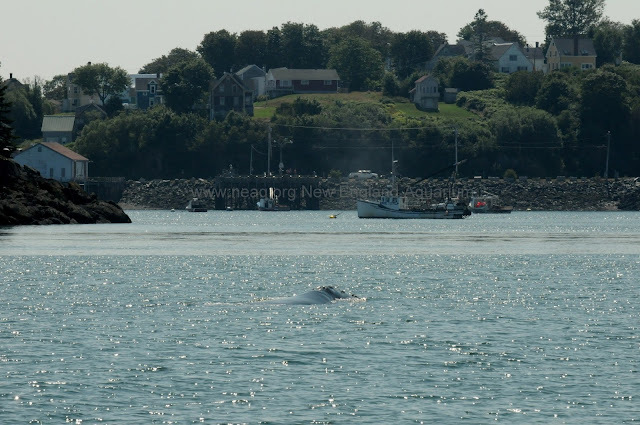 Never in our wildest dreams did we think that they would make their way over towards Lubec, ME, home of our field station! The team was on land on Wednesday due to fog in the Bay, so we were all available to hop on the boat when we received a report from whale watch boat Quoddy Link Marine of a right whale mother and calf pair by Wilson's Beach, on the western side of Campobello Island, N.B.! This is a highly unusual location for right whales, and only a handful in the history of the research project have ever swam over this way. The team rushed into action, loading our research equipment onto the R/V Nereid and zipping over to the last reported location of the whales. 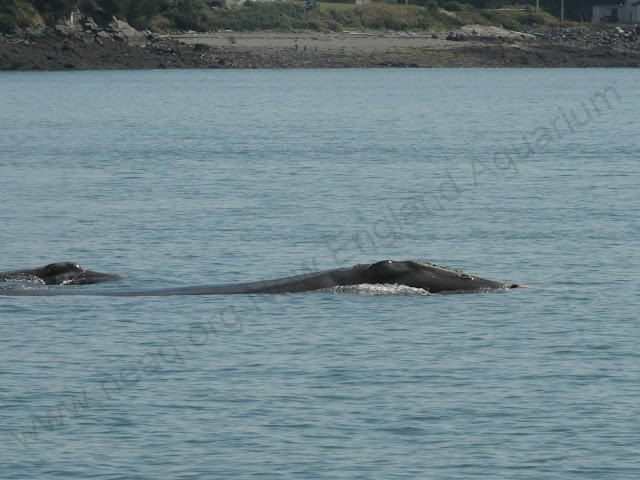 After getting a good look at the mom, we knew it was #3513- her and her calf are the only whales the team has documented in the Bay of Fundy so far this season. The calf is one of 20 born this year, and looks plump and healthy. 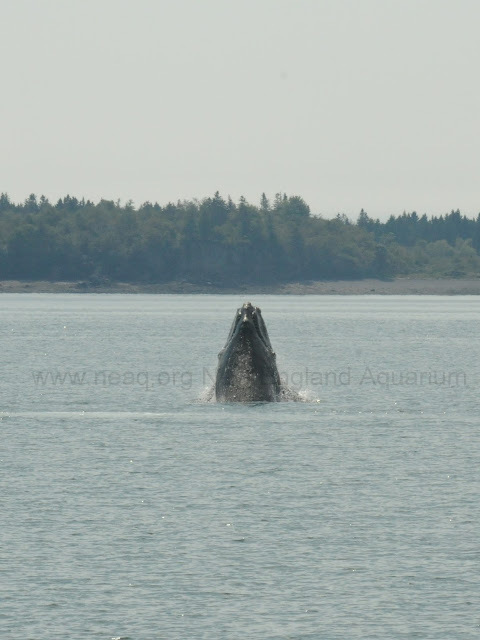 We stayed with the pair to monitor their movement and behavior as they swam south towards Lubec. Word of the presence of the whales spread fast, and many people on both water and land got great looks of the pair during this rare event! We maintained radio contact with the Coast Guard and whale watch boats, and passing vessels were respectful of our requests to slow down and keep a healthy distance of the pair. It was a unique situation to have right whales quickly crossing back and forth across the U.S and Canadian border- countries with different laws about the amount of distance required between humans and right whales. We were all hoping that the pair wouldn't cross under the Roosevelt International Bridge, which connects Lubec to Campobello Island; the shallow waters and the maze of fishing gear that exists there could have resulted in trouble (right whales have an extremely high rate of entanglement- 83% of the population has been entangled in fishing gear at least once). Fortunately, the whales didn't go near the bridge, and after circling near a small island called Popes Folly, the mother began to lead her calf back north towards Eastport, ME. 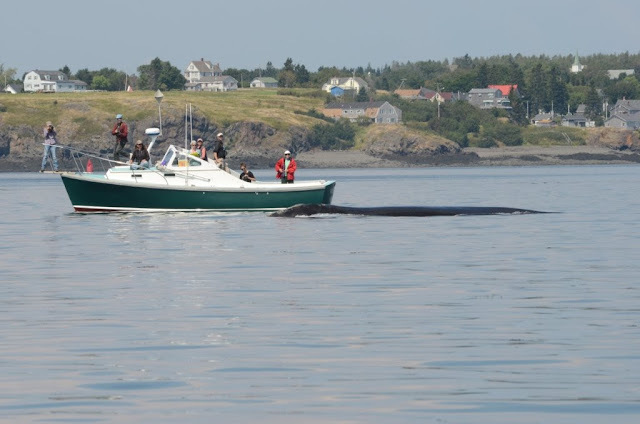 The whales were last seen continuing northward and haven't been resighted in the area, so hopefully #3513 was able to safely guide her calf back into the much larger Bay of Fundy. Here's a little video footage of the day! Wow, unbelievable! What will they surprise us with next? I know, Jenny! This mom/calf pair has been taunting the Acoustic team- they couldn't make any recordings even though the whales were right here because of too much boat traffic!